These two are about to turn into mortal enemies. White-tailed deer and Eastern wild turkeys eating at the same table! Two deer, a buck and a doe, shared their feeding station with a mega-flock of turkeys this week. Here’s the playlist, with all sorts of turkey and deer goodness! Somewhere along the way, Western man lost his way. He became so alienated from the world around him, and the forces of progress– the Enlightenment, reason, and the democratic tradition– became lost in a sea of irrelevant causes. The modern animal rights movement is the epitome of this great floundering. I would argue that its rise in recent years has more to do with the impotence of the forces of the left. Very few tenured academics stand with unions or racial justice groups, lest they be called “political” or “Marxist.” However, an academic who attacks those who hunt deer or eat pork-chops isn’t really attacking anyone in power, so it’s tolerated. I am someone who loves animals very much. I am deeply fascinated with them, and I have been ever since I could walk. My grandmother, an avid amateur photographer, took many photos of me at a young age, and one of my favorites that she took of me is the one where I am observing a young chipping sparrow that fell out of its nest. I’m crouched down behind it, utterly transfixed. I am appalled by the notion of gratuitous animal suffering. However, I also am of the mind that it must be shown to me that the suffering is both unnecessary and gratuitous. Sometimes, animals suffer, but the alternative is even worse. For example, in long-tailed wool breeds of sheep, it is customary to have the tails docked to prevent maggot infections in the wool around the tail. These maggot infections are far more painful than the sheep would experience if it experienced a simple docking procedure when it was a young lamb. Likewise, people can go on and on about how cruel foxhunting is, but they don’t seem to realize that when red foxes become overpopulated, mange starts spreading through the populations very rapidly. If the foxes were thinned out, either by the gun or with the use of hounds, then there wouldn’t be so many of them dying of mange, which is a far more horrific death than one would experience with a well-placed shot or being rapidly ripped apart by hounds. Sheep don’t have long-tails or constantly growing wool as wild animals. The need for docking is entirely the result of artificial selection. The red fox never would exist at such high numbers, either, had we not artificially cleared the continents of North America and Europe of wolves. which readily kill foxes in exactly the same manner that foxhounds do. Much has been made about the killing of Cecil the lion in recent weeks. Much of this outrage is pretty much what we call a “First World Problem.” Most North Americans and Europeans live in cities and don’t have to deal with large mammalian predators on a regular basis. Their ideas of nature and the truth natural world come from television, movies, and saccharine books. More outrage has been dispensed at the death of a lion than at the refugee crisis that stems from the Syrian Civil War. I don’t think more condemns the status of Western civilization this scandal, which seems to convulse in moral indignation at the death of a lion while so many Western nations have turned a blind eye to the suffering of humanity all around us. But now the tumor of animal rights at all costs has started to metastasize. Not all animal rights activists are outraged at the death of Cecil or of any lion, and good example of this lunacy can be found in this piece by Amanda and William MacAskill on Quartz’s website. In it, the author’s contend that to end animal suffering, we should kill all predatory animals and leave the world to vegetarian animals. Both authors are vegetarians, and if we create a world in which there are only “vegan” animals, then we will do a lot to end animal suffering. As long-term vegetarians who abstain from meat for ethical reasons, we are both supporters of animal activists who seek to improve the lives of animals. So you might expect us to agree with activists like Ingrid Newkirk that the killing of Cecil is a terrible thing. But we don’t. In fact, we think it may be the case that animal rights activists should support the killing of predatory animals like Cecil. Animal activists have different opinions about how we ought to respond to animal suffering. For example, some activists believe that we should aim to increase the welfare of animals within the meat and dairy industries by improving the conditions in which they live and eventually die (welfarism), while others believe that we should aim to abolish these industries altogether (abolitionism). But most animal activists agree that we should try to protect animals from unnecessary suffering and death, and that it is wrong for humans to cause such unnecessary suffering. If we believe that we should protect animals from unnecessary suffering and death than it seems that we should be focusing much more on reducing the non-human causes of animal suffering and death that occur almost continuously in the wild. Which brings us back to Cecil. Just as we may be able to alleviate the suffering caused to wild animals by disease or natural disasters, we might also be able to do something about predation and the often-brutal competition that permeates the natural food chain. The authors act as if we’ve not tried this in some form, but we certainly have. Where I live, there are very few predators of deer, and their numbers can only be checked through human hunting. Because I live where the deer are somewhat smaller than in the neighboring states, there are relatively few hunters who actually do take them. And that means that there are massive starvation die-offs in the deer population that occurs every couple of years. White-tailed deer evolved with predators. Predators made the white-tailed deer what it is today. Its fleeting bounds and long, sinewy legs were crafted through relentless pressure that came from predators like dire wolves, American lions, cougars, modern wolves, and even bobcats. What makes a white-tailed deer a deer is that which it has inherited through the millions of years it has experienced predation. Their noses have been developed to scent out stalking cougars. Their ears have been adapted to hear the odd snap of a twig that gives them notice of the cougar’s approach. A big part of evolution is driven by predators vs. prey. It’s often compared to an arms race. A predator gets faster, and the prey evolves an zigzag escape pattern. Prey animals also evolve rapid reproductive strategies to replace numbers that die as result of predation, and this is something our idealistic authors haven’t considered. 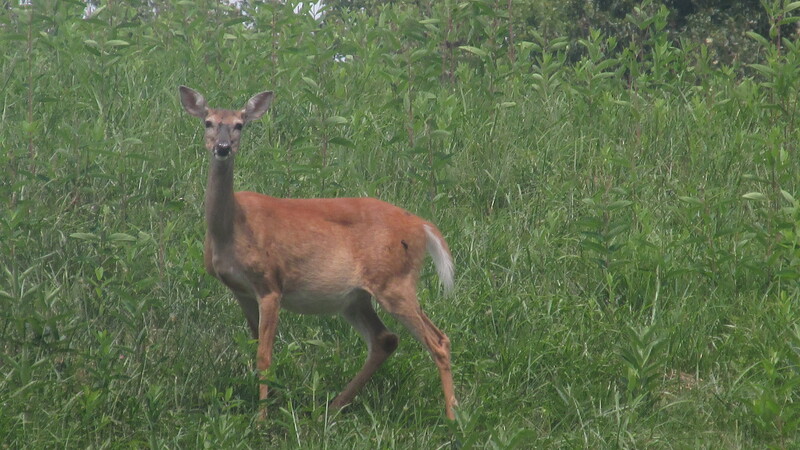 If animals like deer are left unchecked, they will expand and expand in number until they eat all their food sources. And then they starve to death. This was actually what happened at a Dutch nature preserve called the Oostvaardersplassen in Flevoland. Here, red deer, Heck cattle, and konik horses were turned out into a reserve that included some woodland, grassland, and open marshes. And there was to be no hunting on the land. Heck cattle and konik horses represent the primitive wild aurochs and the tarpan that used to roam the Northern Europe, and the red deer were also widespread in the forests. This preserve was meant to be restoration of wild Europe before the dawn of agriculture. Of course, there were no predators on the preserve, and there was no hunting. So the ungulate population greatly increased, and soon, it hit what is known as carrying capacity. Very simply, the ecosystem couldn’t produce enough food to maintain that many animals, and during one really bad winter, the deer starved to death. If the MacAskills’ plans were ever implemented on a large scale, we would see this happen over and over. We would see deer and other vegetarian animals starve to death in vast numbers. Death by a predator or a human hunter is far humane than a long, drawn-out starvation. The MacAskills also don’t seem to understand another aspect of herbivores: Herbivores are predators. To a white pine sapling, there is not a single more terrifying predator than a hungry white-tail in January. So much do deer browse that they are known as the “architects” of the Eastern forest. Plants evolve defenses against predators. Black locusts have thorns to guard their leaves against the deer’s lips, and black birches produce wintergreen oil in their bark, which deer find unpalatable. Other plants produce toxins to keep the herbivores at bay, and with so much predation from herbivores, we could be setting plants into overdrive, with stronger selection pressures for toxins and thorns. This could make plants much harder for herbivores to consume, and it could hasten more suffering from starvation. The MacAskills have dreamed up a wonderful paradigm that makes sense in the urban pseudo-intellectual world, but if it were to be implemented in a real world ecology, it would be a major disaster for animals. When a predator kills an animal, it is not pretty. There is usually a lot of blood. Many predators start eating before the prey is even dead. But this suffering is only a tiny part of the prey animal’s life. It involves so much less suffering than the animal might have experienced had it lived long enough to catch an easily communicable disease as the result of overpopulation or from starving once carrying capacity has been exceeded. Why it is okay for people to philosophize in ignorance of basic biology is beyond me, but this is a case of anti-science from the left that is on almost certain parity with creationism. Life did not develop to be sweet and beautiful. Life is the pulsating horde that seeks only to spread its genes, and the niceties that we know as social animals are but one manifestation of that quest to spread genetic material. That we in our arrogance would seek to take out of evolution one of its most important selection forces is a sign that we have lost it. And Aldo Leopold is spinning in his grave.